Since our last newsletter, we’ve seen yet another unceremonious leadership spill in the Liberal Party, leading to another change of Australian Prime Minister. Unlike the political party room, however, most organisations tend to take a far more measured approach to promoting their leaders to senior positions. Amongst other things, they invest in development programs to build their leadership capability. But unfortunately, in some cases the investment doesn’t always pay off. In this month’s blog we ask a vital question: why do leadership development programs fail? This month we also highlight the importance of supporting any leadership development program with the right balance of digital tools and technology – one of the key trends for HR in 2018: Explore some of the research by MIT Sloan Management Review and Deloitte, as well as Tim Coburn’s report, ‘The role of digital technology in executive and leadership development’. 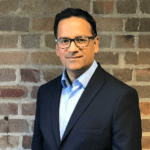 Organisations rely on their leaders to be the vanguards of change and growth in an increasingly fast-paced and disruptive business environment. They expect top teams to lead the charge and set the pace to maintain a competitive advantage. And they’re willing to place some big bets on their leadership. Globally, organisations spend $50 billion dollars every year to build leadership bench strength through learning and development. Yet, in many cases, there’s little pay back. Learning and development doesn’t always lead to better organisational performance, because people typically revert to their default behaviours. We call it “the wheels coming off” leadership development – because in many ways, that’s exactly what is happening. Think of it like a Formula 1 pit stop. 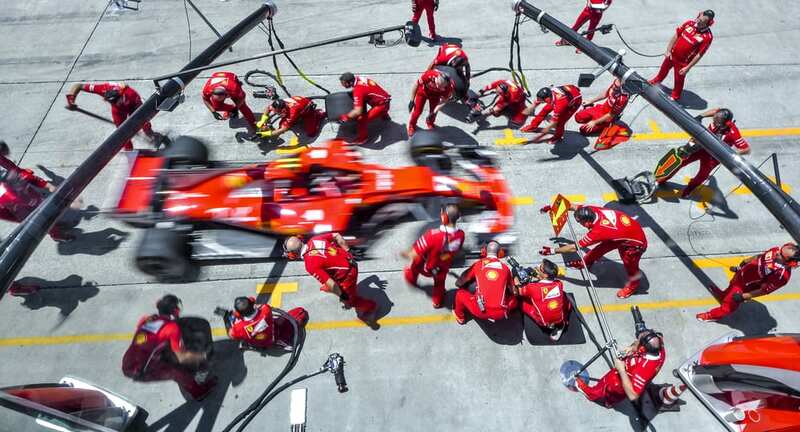 To stay in the race, the pit stop crew needs to ensure that the four wheels of the car are replaced at speed—and simultaneously—before the vehicle screams back out into the race. If the car attempts to re-join the race with a missing wheel, it’s likely to be a spectacularly expensive failure. Yet, in many of the leadership development strategies we’ve encountered over the years, one or more of the metaphorical wheels is missing before the strategy is implemented. It’s little surprise when the leadership development gains no traction. 1. Meaning – is the organisational context being taken into account? In leadership development, one size doesn’t fit all. In fact, one of the first questions to ask when designing a leadership development initiative is, “How, precisely, does this leadership program enable our strategy or organisational culture?” and “What are the 3 or 4 behaviours or competencies that will make the biggest difference?” These are crucial questions because we’ve seen that leaders – especially when under pressure – tend not to engage with capability development unless they understand its relevance. The relationship between meaning and engagement is well illustrated in the story of President Kennedy’s first visit to the NASA space centre in 1962. During the visit, he noticed a man carrying a broom. He interrupted his tour, walked over to the man and said, “Hi, I’m Jack Kennedy. What are you doing?” “Well, Mr. President,” the janitor responded, “I’m helping to put a man on the moon.” When leaders can see that their participation in a developmental program is helping them put their equivalent of a ‘man on the moon’, we’ve seen that you not only get buy-in from those leaders at a rational level but, crucially, at an emotional level too—the vital trigger for behavioural change. 2. Mindset – are underlying beliefs, values and judgments being addressed? Mahatma Gandhi once famously said, “Be the change you want to see in this world.” When senior leaders believe this idea applies to their teams, but not to them, there’s a serious risk of the wheels coming off the entire leadership development initiative. And there it was. The source of the trust issues! The mindset of the leader is a powerful thing. Essentially, the weather in their mind sets the climate of the day for their team. They know that the culture of the business is shaped by them and they are responsible for the team’s activity and capability. So, when things aren’t working they know they are probably one of the root causes. In the case of the CEO, he agreed to “look in the mirror” through a 360-degree performance assessment and through the process of executive coaching. The coaching coupled with team workshops resulted in a significant lift in engagement scores of the team. 3. Measures – are internal systems working for and not against the initiative? Often we’re asked to work with teams to help build collaboration across functional and organisational lines: to ‘de-silo the business’. And when we ask about the remuneration policy, we discover reward is focused on individual business unit hitting their own targets. Unless there is alignment between the objectives of the leadership development program and internal systems and the goals, the program is doomed to failure before it even starts. 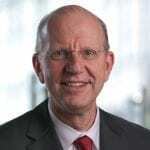 ‘Measures’ also refers to measuring the outcomes and impacts of the leadership development initiative because, as stated so eloquently by leadership guru Peter Drucker “What gets measured gets managed”. But ensure that the right outcomes are being measured. Immediate evaluations are good to ensure hygiene factors are being catered for. But what counts is long-term behaviour change; it’s important, for example, to undertake longitudinal evaluations to measure change 3, 6 and 12 months after the development initiative. This is where the rubber hits the road. 4. Momentum – are there mechanisms in place for sustained behavioural change? A leadership development initiative that is an ‘event’ might provide an immediate boost in excitement and engagement—but it’s fleeting. The half-life of learnings from one-off development programs is about 3 months. And then participants are doing well if they can recall one or two key ideas. For a real return on investment there need to be conscious mechanisms in place that embed and sustain learnings. Effective measurement is one thing but alone will not create the basis for sustained change. Genuine interest and role modelling by senior leaders in their peoples’ development are critical to create momentum. One client we worked with required every participant in its leadership development program to be sponsored by a member of the executive leadership team. The sponsor met with the participant ahead of the program to discuss both parties’ expectations and then at the conclusion of the program to explore how the participant was going to put learnings into practice and what support they needed to assist them in their endeavours from their sponsor. In this regard, technology is becoming a real game-changer. Recently we’ve introduced into our coaching practice a digital management platform that makes it easier to track coaching activity as well as measure real-time behaviour change, accountabilities and return on investment. Just like an F1 racer, leadership development initiatives require technical expertise, a strategic approach and major investment. However, an F1 driver doesn’t stand a chance unless they exit the pit stop with all 4 wheels working together. 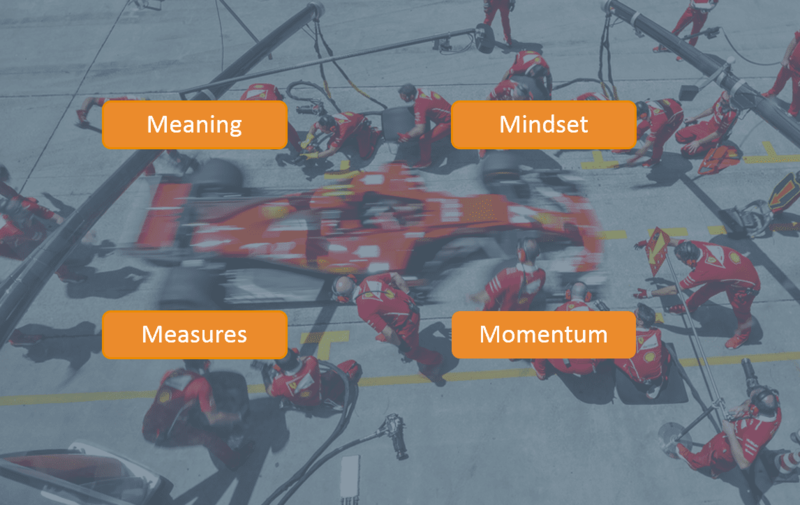 Similarly, for leadership development initiatives to gain traction, and help organisations to keep up with the pace of change, all 4 ‘wheels’ – Meaning, Mindset, Measures and Momentum – must also be working together. And like a successful pit stop, in the end it’s all about a deliberate plan executed brilliantly well. **Want to see for yourself just how perfectly Ferrari can execute a successful pit stop? Don’t blink, or you might miss it! Ready to take your next step in your leadership path? With a practical hands-on approach and focus on personal presence and communication; resilience; change and complexity; return to your workplace at the conclusion of our 2 day Perspectives on Leadership for Women program with increased confidence to address challenges and make an impact. With the added bonus of two follow up individual executive coaching sessions, know you have the support you need to take your next steps to leadership. Our executive presence and impact workshop empowers you to foster your authentic leadership presence, develop your confidence, and become more influential. It enables you to recognise and overcome your roadblocks to success. Limited to 10 participants for maximum development opportunity. Learn more or click here to register. We highlighted in our blog that technology plays a vital part in enabling a sustainable developmental program. 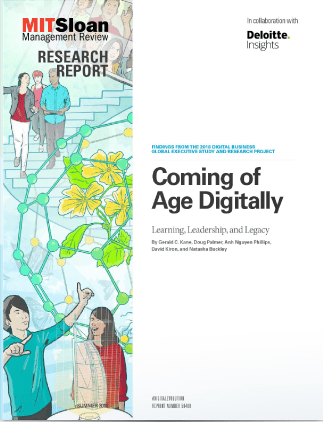 This idea is reflected in the fourth annual global survey of digital business practices, conducted by MIT Sloan Management Review and Deloitte, which says that companies need new approaches to leadership development and employee learning. It highlights the need for organisations to create environments that foster continuous learning. In an increasingly digital world, this requires greater focus on experimentation and innovation. 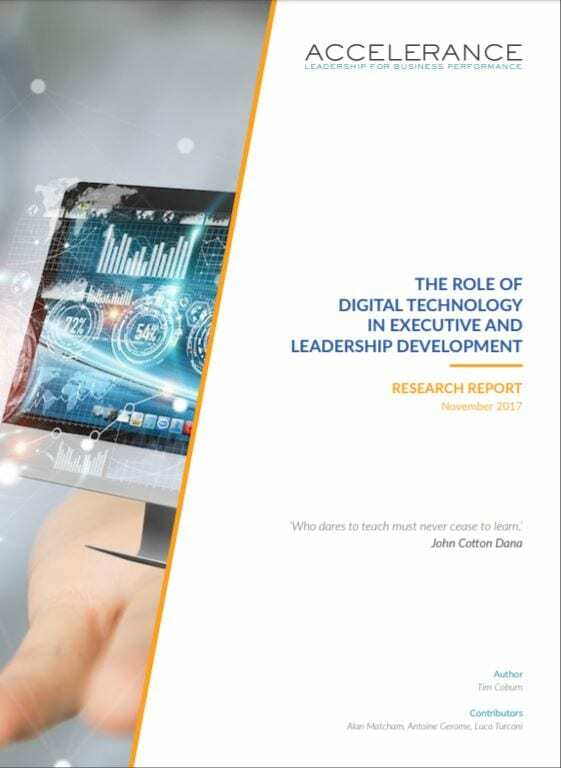 Combining real world insights from heads of leadership development and a distillation of ‘ideas that work’, Tim Coburn’s report, ‘The role of digital technology in executive and leadership development’, offers practical steps for accelerating the use of digital technology in executive and leadership development. In one of those fortuitous decisions in life, I joined a small engineering and infrastructure consultancy business which evolved to a global top five. 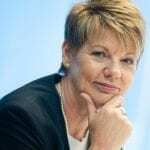 As the business grew, my career took on a life of its own, transitioning from being a technical expert to overseeing major projects, to leadership of global teams and operations, and culminating as a member of the Board. The business was ahead of its time in leadership and talent development. Not a year went by without some form of leadership and development training. That instilled a deep belief in the value and impact of coaching/mentoring, both for personal development and business performance. What shouldn’t surprise, but still does, is the extraordinary diversity of people. Having said that, the core challenges being experienced are similar, but in different ways, if that makes sense. Also, the trust given to the coach/mentor relationship—which is something quite special. What do you find most challenging about being a coach/mentor? Coming from a very solutions/outcome driven career, I am always mindful of nurturing and guiding each coaching assignment rather than pushing or driving the process in pursuit of early outcomes. As a coach you need to trust yourself and the process. My first reach out is to share the uniqueness of the coach/coachee relationship, plus the sometimes life-changing insights that can occur, embrace the experience, be present, allow the process to map its own path. And above all, enjoy. To understand that learning what it is, and what it takes, to be an effective leader never concludes—because leadership is about people and context and these are forever dynamic. My other advice is to look on progression to a leadership role as essentially a journey of self-discovery. I have had a number of key mentors in work and life (and still do). They were people who believed in me (often when I didn’t believe in myself), who showed me tough love at times, held true to their values, and had strong moral compasses. I must say there were a couple of other mentors early in my career who were not a good influence and, thankfully, others cared enough to intervene. Exercising and training the new man in my life (Henry, a corgi puppy); I am a voracious reader (fiction, history, biographies, research, business, etc); good food and wine. I practiced Wing Tsun Kung Fu for several years and still practise my form every day. It came from a coaching conversation … to find an activity which I knew nothing about and where I would learn to be comfortable being uncomfortable – Kung Fu ticked those boxes!! Out and about enjoying the delights of Sydney and surrounds. My greatest inspiration is… my mother who never had the opportunity to attend university but is passionate about life-long learning. In her 80’s, she works part time at my brother’s technology business doing computing work and attends U3A (University of the Third Age). The greatest lesson I learned was… life is a journey and to take the long view— and I learned that later in life!! !